French Palme d’Or winner Jacques Audiard’s The Sisters Brothers gallops into UK cinemas this week with John C. Reilly and Joaquin Phoenix as two gunfighting brothers in a brilliant postmodern western of true wit. “Well, we fucked that up,” states Eli (Reilly) as he and his brother Charlie (Phoenix) walk away from a gunfight that has left six or seven dead and a barn on fire filled with dying horses. They’d only wanted to kill one man. The ‘Sisters Brothers’ are a pair of guns for hire. Eli is the goodish one, in that he worries about the jobs they get from the Commodore (Rutger Hauer, in a wordless cameo) and he treasures a shawl gifted to him by a schoolteacher. Charlie, on the other hand, is a sociopathic drunk who takes a carefree pleasure in his work and has ambitions to go far with the killing they do. Their latest mission is to hunt down a chemist, the Hermann Kermit Warm (Riz Ahmed), who tracker John Morris (Jake Gyllenhaal) has gone ahead to find and apprehend. The story – adapted by Audiard and his writing partner Thomas Bidegain from Patrick Dewitt’s novel – initially moves between Morris and Warm, who begin to develop their own relationship, and the brothers who track them. The journey has all the hallmarks of the epic western quest, but Audiard will foreground Charlie making water before the beautiful panorama. Likewise, the gunfights are not Leone-esque operas where the arias are stared, not sung, but instead smoky, indistinct affairs where the guns spark and flash. One begins with a torrent of vomit before the shooting commences. In a sly dig at The Revenant, a bear is dispatched offscreen with the minimum of fuss. 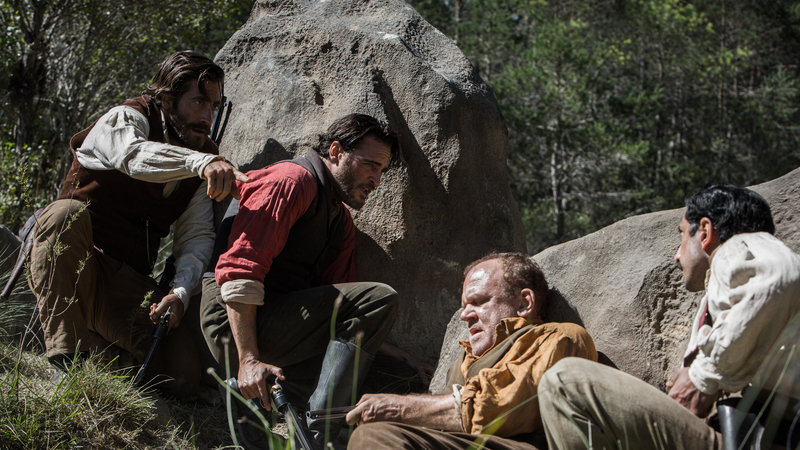 The end of the West is a constant theme of the genre and The Sisters Brothers is no different – but even here progress is introduced with an emphasis on the mundane. It isn’t the onset of the railroad of Once Upon a Time in the West or the vision of the motorcar in Peckinpah’s The Wild Bunch, but rather the purchase of a toothbrush that shows perhaps the cowboys’ days are numbered. At the heart of the film are two pitch perfect lead performances. Though Reilly and Phoenix don’t look particularly like brothers, they certainly behave like them. Their endless teasing and bickering make for some of the best moments in the film. Reilly is the put-upon elder brother who feels he needs to protect Charlie from his worst excesses, but even Charlie also has something like a dirty innocence. He’s a wounded soul whose blank incomprehension when he finds one of his victims praying is both funny and horrifying: “What are you talking about?” he says before delivering the coup de grace. Gyllenhaal and Ahmed give sterling support, but they’re more recognisably conventional characters who the brothers once more undercut, criticising John Morris’ letter-writing skills. “I don’t like that ‘post-haste'” Charlie says. In fact, after the profanity-laced Shakespearean barrage of Deadwood, Dewitt and Audiard’s Wild West is a more prosaic place, but it is also sharply intelligent, extremely funny and full of surprises.